Deer in a back yard. A central Iowa police department is compiling a different kind of “Most Wanted” list. 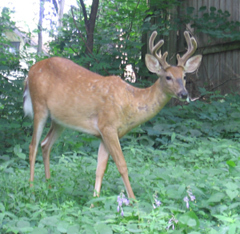 Police in the Des Moines suburb of Urbandale are looking for pictures of male deer. Officer Jeff Casey says they want to try and thwart poachers who want trophy bucks. He says they started by asking officers and registered bow hunters to send in photos of bucks so they have an idea and inventory of the bucks out there. “We’ve had an extreme problem with poaching deer out in Urbandale over the past years in Urbandale, where we’ve found numerous bodies of deer missing their heads, just laying in ditches or on private property,” Casey says. Casey came up with the idea of making a photo lineup of the deer. Casey says he was talking with hunters and they told him how they had some nice pictures of bucks. Casey says he came up with the idea of keeping the photos of the bucks on hand that they could share with the Department of Natural Resources, so if someone turned in a trophy buck, they could check to see if the animal was taken illegally. Casey says they are compiling the pictures they can find Casey says they are also looking for residents to send in their deer pictures. He says they are asking anyone who has photos of the large bucks to send them in with information on where the photos were taken so they can tell one buck from another. Casey say they believe they can identify individual bucks by their antlers and other characteristics. A trophy buck can bring several thousand dollars, and Casey says they hope to take away that incentive to illegally kill the animals. “We’re gonna to try and take that monetary prize away from them, so if they do harvest a buck illegally, then they’re basically gonna have to hide it for quite some time,” Casey says. Casey says the deer population has become quite thick in Urbandale and that makes it easier for poachers to come in and try to take an easy trophy. Casey says the D.N.R. survey found deer populations ranging from 105 to 125 deer per square mile, and they would like to see the population to come down to 30 per square mile. But, Casey says they have legal bow hunts in the city limits to deal with the population.